La Perla Estate is absolutely gorgeous. This is hands down one of my favorite estates on the island, because each villa is so thought-out and lovely. Bianca and Classic, the two outer villas, are perfect one-bedrooms for couples. The center villa, Palais, is perfect for families or large groups. 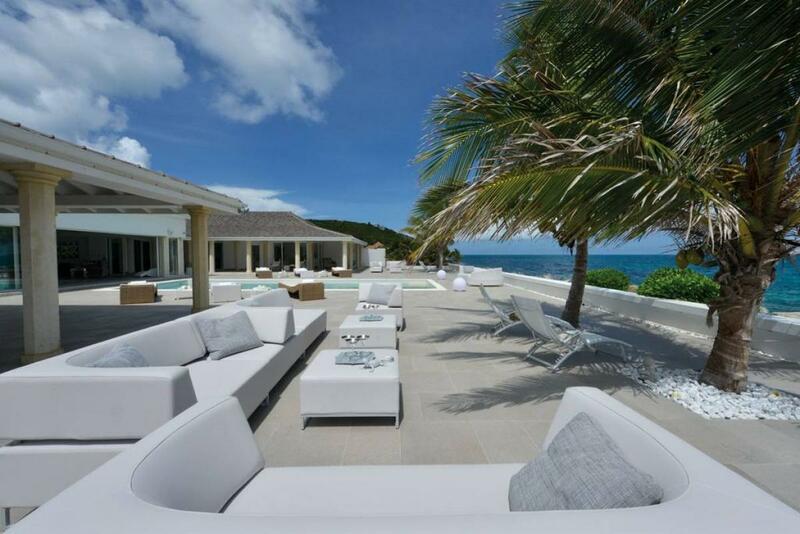 La Perla Estate is located on Baie Rouge, one of the most beautiful beaches in St. Martin. The principal property in the La Perla Estate is “La Perla Palais”, and two additional villas, La Perla Bianca and La Perla Classic, sit on either side. Each villa is completely independent and has its own private driveway, pool, hot tub and private terraces. La Perla Palais begins with an oversized outdoor chess game in the tropical gardens, and a sweeping staircase leads to the main reception area. The spacious living area stretches across the villa, and opens to the huge terrace. The villa’s gourmet kitchen and a second professionally equipped service kitchen add even more luxury to the space. The pool terrace has multiple lounging and dining areas, each perfect for al fresco entertaining. The huge pool overlooks the ocean, but guests also have access to a private beach for a taste of the sea. Each of the three master suites- Klimt, Venetian and Lulu- have lavish ensuite baths and walk-in closets. The villa is air-conditioned throughout, with a media room, fitness room with a Power Plate machine, and a Jacuzzi. La Perla Bianca is a one-bedroom villa with air-conditioning throughout. It has an open floor plan living area with a gourmet kitchen.Floor to ceiling windows reveal the king-sized bedroom suite with an ensuite bath, walk-in closet, and Jacuzzi. There is a wading pool and covered terrace in the back that seamlessly blends with the indoor living area. La Perla Classic is a more chic version of La Perla Bianca with the same high end amenities; ensuite bath, king-sized bed, and a Jacuzzi. The infinity pool is surrounded by loungers on three sides and a covered living and dining area that connects the outdoor area to the indoor area. Together, La Perla Palais, La Perla Bianca, and La Perla Classic offer privacy, beachfront status, and high end amenities. Bianca and Classic are best for individual couples, and Palais is ideal for large groups or a family. Directly on Baie Rouge Beach. A villa representative meets you at the airport and escorts you to your villa. (Guests must provide their own transportation.) Rental car can be arranged for pick up at airport or be deliverd to the villa.